1. Cobra Company's 1:35 AH-1W NTS (Night Targeting System) resin conversion #35009 for the Academy/MRC/Italeri kit has now been released. The instructions give a good idea of where everything goes, with some monochrome photographs (by Randy Smith) added for clarification. There are so many publications with colour photos available for further reference that there should be no trouble getting everything exactly placed and painted. 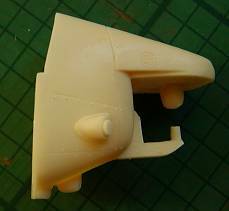 I have a slight reservation about the shape of the oil cooler in comparison with the one shown in the photograph in the instructions, but there is a suggestion that there may be more than one pattern fitted to NTS modified aircraft. In any case the part can easily be given a more curved profile with careful sanding if you decide to alter it. If you got your order in very early you might be missing a couple of parts. Cobra Company say: "Sorry folks, the first 22 sets have an omission on the page one instructions pertaining to the assembly of seats. There are only two of part #18 included in the kit, two extra must be cut from card stock". These are head-protection armour, and are indeed very easily duplicated from plastic card, so this is not a problem. 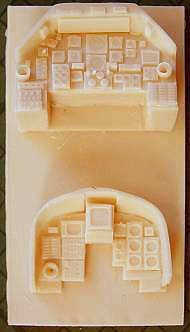 Overall the mouldings (a total of 45 separate parts) are impressive in both detail and quality (only one air bubble noticed in the entire set, on the tip of it’s nose! ), and are highly recommended. Note that the recent decal sheet #35001 from Twobobs Aviation Graphics includes markings appropriate for several different NTS modified Cobras. 2. One of our readers has bought Eduard's recently released AH-1W/T Super Cobra Armament set #32091 (see HKN #159). He comments: "It says 'Armament Set' but all that's included is photo-etch to detail (build) two tow missile lauchers (four missiles). It looks like they will be good looking launchers but that is all that's there - enough for one side and that's it. Plus it wouldn't take much effort to detail the MRC launchers with scratch bits." 3. It was in 1998 that HKN first started hearing rumours that the Canadian company Leading Edge Models were planning H-34 (and CH-135) decals, so it's very pleasing that they have now released their first helicopter markings, 'RCAF / CAF H-21 and H-34' #72.072. 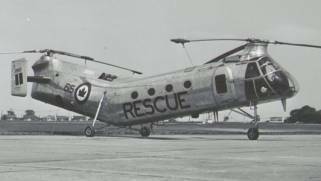 The RCAF purchased six Piasecki H-21A (9610 to 9615) in 1954, and nine H-21B (9636 to 9644), these were re-designated CH-125 in 1968. 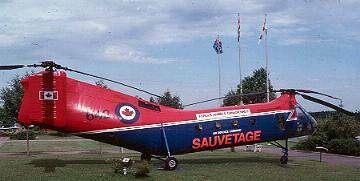 They were used in support of the Mid-Canada radar line and with Rescue units such as 102 KU/424 Sqn. and 111 KU/440 Sqn. until they were retired in 1971/2. There were also some Vertol H-44A variants (9591 to 9596), some of which had faired & spatted undercarriage as in Italeri #007 and Revell #4447, and at least one (6591) was photographed with external tanks as provided in Italeri #1203. There are no markings provided specifically for these H-44’s, although it appears that everything is there except the necessary serials, so they too could easily be built, if you can find the references. The H-21A had on the port side a cabin door with a rounded top, and three round windows. The end plates were trapezoidal. The H-21B had on the port-side a cabin door with a square top and rounded corners, and four round windows. The end plates were parallelogram shaped. Both patterns of end-plate are included in all versions of the Italeri/Revell kit, but none have the rounded-top door – though this is easily modified. All have RESCUE markings (but note that you can't make the last 'bi-lingual' option because there is no 'Sauvetage' decal included, no great loss unless you are ardently Quйbйcois). The white bands and flashes are provided as decals, as is a spare Piasecki logo. There are enough decals in the set to make three separate models, one in each of the three basic colour schemes. 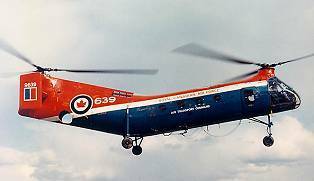 Canada was the second ‘foreign’ user of the H-34 (after France), operating six (9630-9635) between 1955 and 1972, making them almost exact contemporaries of the H-21’s. All six were H-34A variants with the original ‘bent-leg’ style of undercarriage (although Len Lundh in his excellent Schiffer Publications H-34 book (refer to this for RCAF H-34 operational history) states that 9632 was subsequently converted to ‘v-leg’ configuration. H-34A 9633 Rescue CAF/FAC, colour a/a but with red replacing the dayglo on the top of the fuselage. As with the H-21, the various cheat-lines, bands and flashes are provided as decals. There are enough decals in the set to make two separate models, one with a white band and one with a flash. The decal printing appears to be of the finest quality, and perfectly colour aligned. The instruction sheets are clear and unambiguous, with suggested paint matches and rotor colour details. Leading Edge have asked me to pass on their recommendation that all the larger decals and cheatlines are dipped in hot water, as this helps the decal itself to stretch along with the expansion of the wetted paper backing. 4. Begemot (that's 'Behemoth' in English) are a new Russian decal maker who have produced sheets in 1:72 for the 'Helix' and 'Hind'. The descriptions below are based on emailed scans, so no definite comment on quality can yet be offered, although they look good so far. There is evidence of slight colour mis-alignment on both sheets, but nothing serious. Information about availability should follow in a few weeks time. Ka-27PL yellow 02. Soviet Navy Northern Fleet, Severomorsk airbase, early ‘90s. Overall light blue-grey (Humbrol 145). Ka-27PL yellow 22, Russian Navy Black Sea Fleet, Kacha airbase, 2001. Colour as above. Ka-28 (export 27PL) white 403, Yugoslavian Navy, early ‘90s. Colour a/a. Ka-28 black 597, Indian Navy, mid ‘90s. Overall grey-blue (Hu 109). Ka-29TB yellow 38. Russian Navy, MAKS-97 air show. Light blue-grey (Hu 145) with grey-blue camouflage (Hu 125). Ka-29TB, as operated in the reconnaissance & target designation role for a pair of Ka-50s in Chechnya, Dec-2000 to Feb-2001. No bort numbers or insignia. Light blue-grey (Hu 145) with grey-blue camouflage (Hu 125). Ka-27PS yellow 21, Russian Navy Northern Fleet SAR on carrier ‘Admiral Kuznetsov’, 1998. Light grey (Hu 127) with white sides and a broad red band along the top and underneath. Ka-27PS blue 54, Russian Federal Aerospace SAR Service, North Caucasian Military District, 2002. Colour a/a. 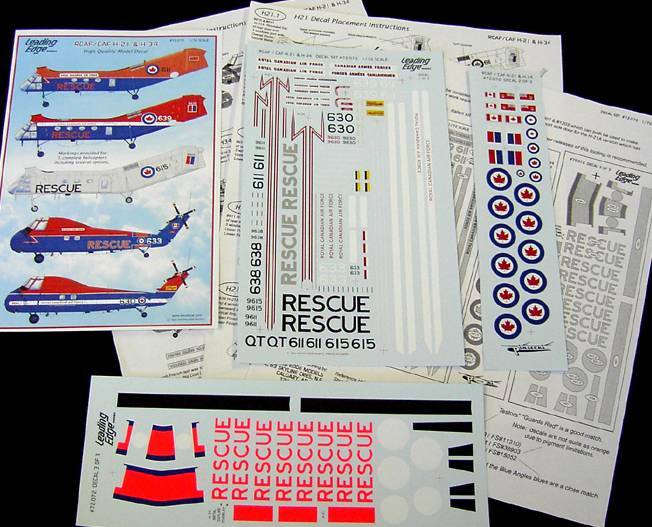 As well as the individual markings, which include various insignia and badges as appropriate, an extensive selection of ‘technical service writing’ (stencils) is supplied, though only enough for one complete aircraft. 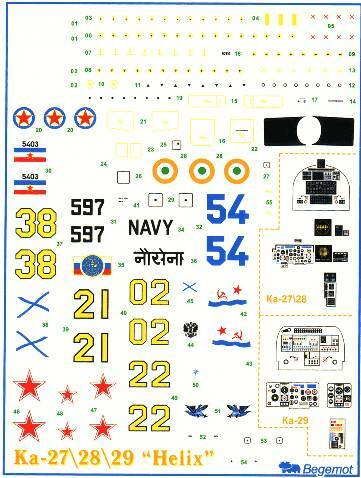 Instrument panel decals are provided for one Ka-27/28 and one Ka-29. The instructions in Russian & English also include details of rotor colours plus a list of references. Mi-24D black 328, Sandanista Air Force, Nicaragua, 1987. Red-brown (FS 30219) with leaf green camouflage (34079) over light blue (35526). Mi-25. 4492 (Arabic script). Iraqi AF, captured by US near Basra, Desert Storm 1991. Sand (33254) with dark green (34091) camouflage over pale grey-blue (36329). Mi-24D white 08, Georgian Air Force in Georgia/Abkhasia conflict, Sukhumi, 1992. Light grey-green (36583) with grey-green (34226)‘trefoil’ camouflage over light blue-grey (35622). USSR bort numbers & insignia visibly over-painted. Mi-24V white 41 / MC. CIS Peacekeeping Force in Georgia/Abkhasia conflict, Gudauta, 1994. Pale grey (36595) with dark grey-green (34095) camouflage and light blue (15123) bands along sides of tail. Undersides light blue-grey (16473). Since 2001 the same aircraft in the same markings has been operated by Russian forces in Chechnya. Mi-24V blue 23, USSR Air Force, Kabul, Afghanistan, 1984. Sandy brown (30072) with dark brown (30045) camouflage over pale grey-blue (36329). Mi-24V black 0204. Czech Air Force aerobatic team, Prostejov, 1997. Dark grey-green (34128) with dark green (34226) camouflage over light blue-grey (35622). Shark-mouth. Mi-24V black 30, Ukranian Air Force UN Peacekeeping Force (UNTAES) in Croatia, Vukovar, 1997. Overall white except for black rectangle behind exhausts. Mi-24P. Russian Task Force in Chechnya, Mozdok airbase, 2000. Pale grey (36595) with dark grey-green (34095) camouflage over light blue-grey (16473). Mi-24P 96+50. German Air Force, 1996, later transferred to US Army. Green (34128) with light brown (23448) camouflage over pale blue-grey (36329). Mi-24P yellow 08. Russian Army Berkuty aerobatic team, Torzhok, 1991. Pale grey (36595) with dark grey-green (34095) camouflage over light blue-grey (16473). Red, white & blue stripes (not provided as decals) along sides over camouflage. Mi-24VM. 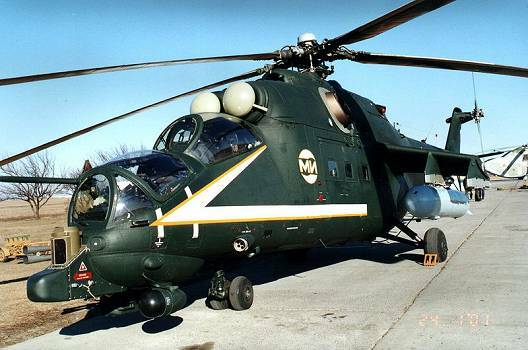 Rostvertol (Rostov-on-Don Helicopter Plant) 60th anniversary, 1999. Overall black-green (34050) with a yellow & white fuselage flash. 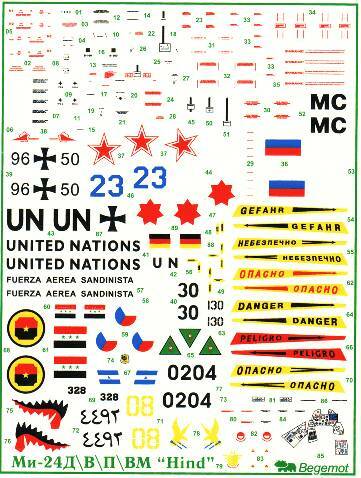 One very full set of stencils for airframe and for various weapons options is provided, along with one set of instrument panel decals. The instructions in Russian & English also include very full details of rotor, stores pylon, and weapons colours, plus a list of published references. 6430, UH-60 Blackhawk, 1:35, probably a re-box of the Academy kit. The first two are carried over from 2002, and there is nothing at all new in 1:72, for the first time in 10 years. 9. Testors have released something called a "QuickBuilder AH-64 Apache". The scale is 1:32. 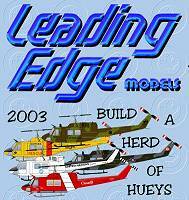 It is not known whether this is related to the 1:32 Revell-Monogram Apache kit in any way. 10. Contrary to the information in HKN #160, Revell's 2003 catalogue does not include #4414, a 1:48 Bo-105, so we have to assume that the plans for this have been put on hold. 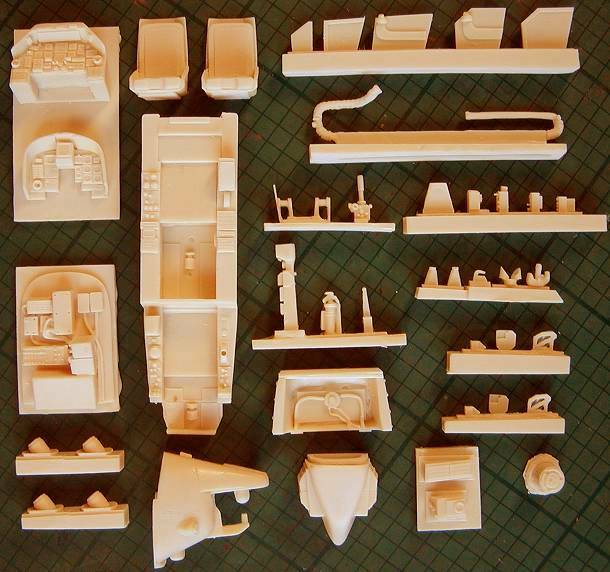 Thanks to Dave Koss (Leading Edge Models), Chris Miller (Cobra Company), Philippe Dognon (Landing Zone), George Filyagin, Yevgeny Borissov, Randy Smith, Jan Goos and Scott Hemsley.